As Nick said in his post about writing trivia: "This is the job of the trivia writer: making people feel smart." The same is true of the level designers of digital puzzle games. Although the genre employs a huge variety of mechanics from time and space manipulation to pipeline optimization, all puzzle games strive to make their players feel smart as they complete the puzzles. In trivia, the difficulty of question writing is twofold: first, the questions must be hard enough to feel challenging (and rewarding when defeated), but easy enough to be answered. Second, they must be written with multiplayer contexts of play in mind, and thus should cover ranges of topics to allow each individual or team to answer some questions correctly. 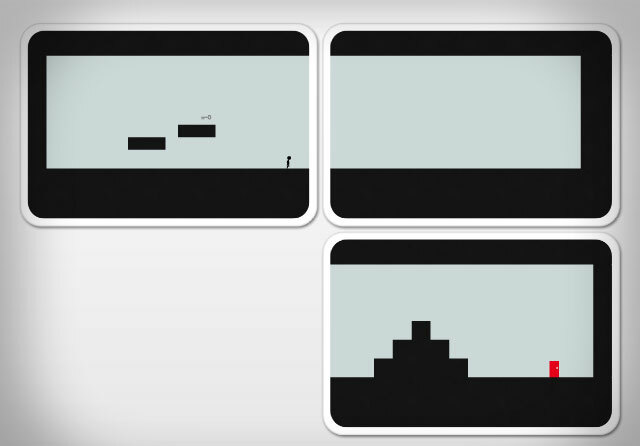 Puzzle game level design is freed from one of these constraints: since the vast majority of digital puzzle games are single player (and those that aren't are cooperative), their puzzles only need to strive to hit the sweet spot between easy and hard. Of course, just like in trivia, achieving this sweet spot is harder than it seems! Since all players are going to have different levels of comfortableness with the core mechanic of the game (for example, in SpaceChem players have robots called Waldos execute sequential actions much like in computer programming. Players with programming experience are going to find the puzzles much easier than those without), puzzles designed for one type of player are going to be too hard or too easy for other types. So how do you do it right? Trusting players' forgetfulness. The sense of satisfaction received from completing a puzzle occurs first when each step is completed, and second when the player can look back at the sum of all the steps she has completed, and can take in the complex puzzle she has just solved. The trick, then, to designing puzzles to make players feel smart is to telegraph the next step's solution at each juncture, but to do it in a way that the player will not recognize, or will forget! Portal, for example, does this extremely well. Frequently, audio cues, lighting, or motion directs the player's attention towards the spot that the next portal must be placed. However, once the player has reached the end of the level and surveys the room of challenges she just completed, she doesn't remember that the game showed her each next target, instead she just sees all she has accomplished. Often, this makes the player feel intuitive--she didn't look at the puzzle and say "I'm going to need to do X, Y, and then Z, and then the door will open." Instead, she had her attention directed to X, did X, and then wondered "what now?" for a brief moment until her attention was directed towards Y. She ends up feeling as if she is just naturally good at these puzzles, which in my opinion is one major motivation for playing games: searching for one's own talents. 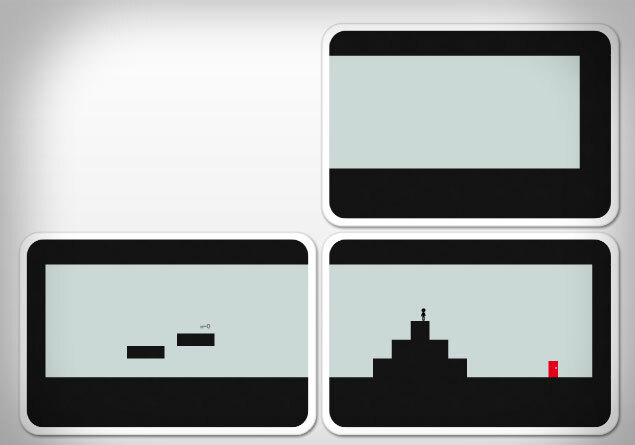 Assuming you didn't actually go play it, the gameplay is surprisingly simple and elegant. 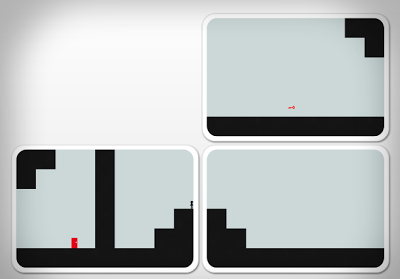 You control a stick figure who can move left, right, and jump. You want to walk your stick figure to a red door. When you get to the door, the level is over and you move onto the next one. Sometimes there are keys in the level you must collect before reaching the door, because it is locked. So far so good, right? You don't see these anymore because now the internet does them for you. The twist is that each level is played on a series of 2D platforming environments, manipulated like one of those plastic sliding puzzles you used to see as a kid (left). At its simplest, the door starts on a different puzzle tile than you do, and you must zoom out, slide the tile with the door next to yours, then zoom back in and make your figure walk from one tile to the next. First, the upper left tile must be moved down. Then the figure can run from the (now) bottom left tile to the bottom right tile and get to the door. But there's one more twist that makes this game the paragon of step-by-step puzzle design: the figure can only walk from one tile to the next if their edges match up. See below. 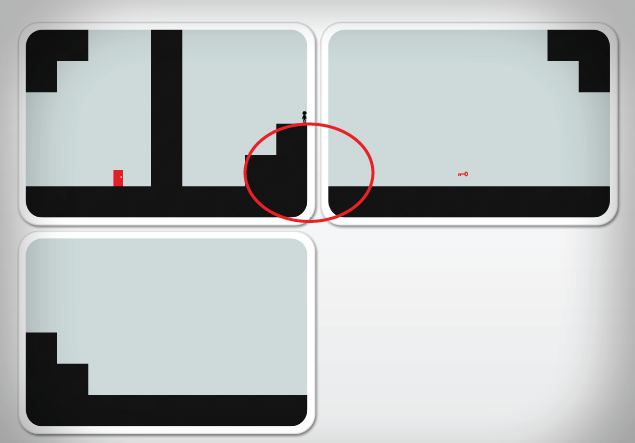 The stairs on the upper left tile don't match the floor on the upper right, so the figure can't jump from one to the next. Again, the edges don't match, so it's like a wall to the character. 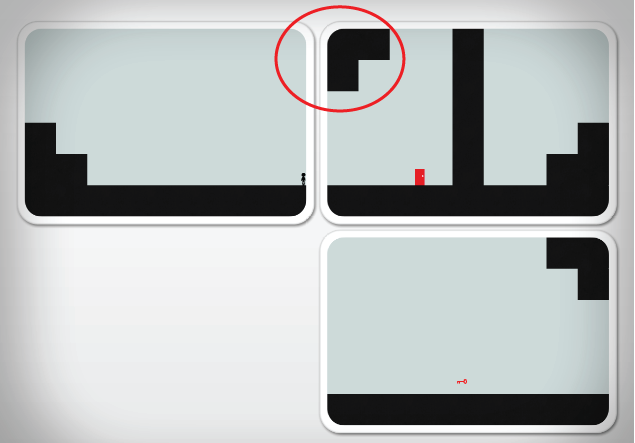 Because the edges line up, the character can travel between the tiles. This twist makes it so that even levels with 5 or 8 tiles aren't too difficult because there's always a clear next step—just find the tile that matches edge(s) with the one you are currently on! Despite this, when players think back about the level they just completed, they think "Wow, I just collected 5 keys and shifted like 30 tiles!" and are proud of themselves. The obvious takeaway from these observations is that puzzle game designers should do what they can to guide players through their levels step by step. But beyond that, can this concept be applied to other game genres? It can already be seen in some. As Nick pointed out, trivia questions in Jeopardy and Who Wants to be a Millionaire hint at their answers, and games that include questions with series of clues lead their players by the nose. As the developing field of game design progresses, we should consider how we can let players think they are finding their own way, while guiding those who cannot, thus making our games more playable by everyone.